Thank you, Tea Party Americans! A big thumbs up to the attendees, organizers and volunteers at yesterday’s inspiring Tea Party Express rally in Searchlight, Nevada. Take a look at these aerial photos from yesterday. What an amazing sight to see thousands and thousands of Americans show up in the middle of the desert to freely assemble and have their voices heard. In Harry Reid’s hometown (while he may have been doing a victory lap over the passage of Obamacare), more than 10,000 concerned citizens rallied to tell him and Speaker Pelosi that we’re ready for November. The Tea Party Express rolls on… can’t wait to see you all in Boston on April 14th! Where Does Obama’s Loyalty Lie? 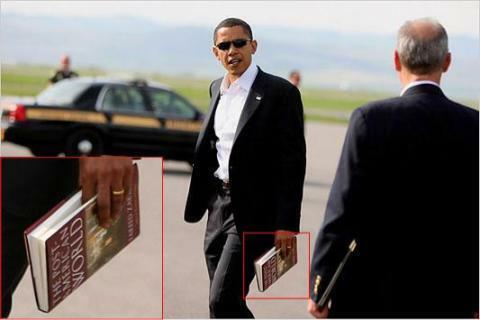 In May 2008 Candidate Obama was photographed walking with a copy of “The Post-American World” by Fareed Zakaria. Monte Kuligowski in an American Thinker article, “Obama’s Post-American World,” questioned how this man running to be our president would read a book about a post-American world (Kuligowski, 2009, ¶10). His choice of reading material was only one of many warning signs pointing to a man whose loyalty lies not with the United States, but elsewhere. We must recognize that Obama’s domestic policies overlap with his global ideology. In Obama’s world, the pie is not growing, and everyone should have the same-sized slice. Spreading the wealth around via excessive taxation, unfortunately for those hoping in hope, will lead to a lack of production and prosperity. It will not create equal slices, but instead shrink the American pie (Kuligowski, 2009, ¶5). Mr. Obama needs a weak America to facilitate his view of global multiculturalism. No country is better than any other. So-called evil regimes are really dispossessed nations that need to be understood and brought to the table. Once at the table, we will see that our mutual interests make self-interests innocuous. Old views of American exceptionalism are simply worn out (Kuligowski, 2009, ¶6). The President is a creature of postmodern, post-Christian thinking. He is a new kind of leftist. Barack Hussein Obama is essentially a global Marxist. On a global scale, the proletariat consists of the poor nations of the world that have been oppressed by powerful, greedy, self-interested countries. The United States is the prime example of the global bourgeoisie. The evil, capitalistic country, still high on religious opium, represents all that is wrong with the world (Kuligowski, 2009, ¶7). In April 2009, Obama was gifted with a copy of “Open Veins of Latin America: Five Centuries of the Pillage of a Continent” written in Spanish. Granted, Obama does not understand Spanish and it is safe to say he has not read the book. But, Open Veins is something he would agree wholeheartedly with. 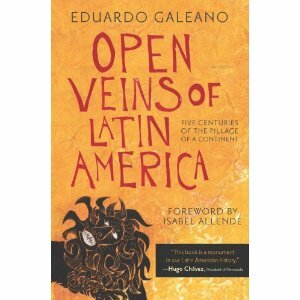 The premise of Open Veins is that the US among other countries exploited Latin America – the proletariat nations “oppressed by powerful, greedy self-interested countries” Kuligowski referred to (Tapper and Miller, 2009, ¶1-12). Chavez who heads an authoritarian communist regime is in bed with Iranian President Mahmoud Ahmadinejad. At a UN meeting, Chavez referred to President Bush as “the devil” and routinely railed at the United States as being an “evil imperialist” nation. Sound familiar? “Hey, Obama has just nationalized nothing more and nothing less than General Motors. Comrade Obama! 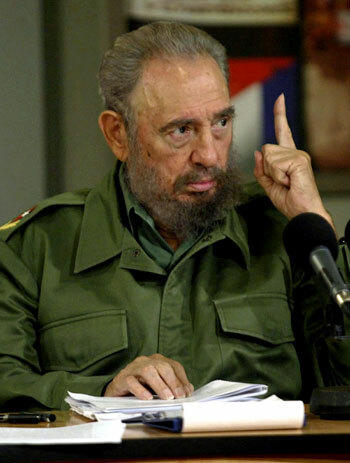 Fidel, careful or we are going to end up to his right,” Chavez quipped in a June 2009 broadcast (Pretel, 2009, ¶3). “During a decade in government, Chavez has nationalized most of Venezuela’s key economic sectors, including multibillion dollar oil projects, often via joint ventures with the private sector that give the state a 60 percent controlling stake.” (Pretel, 2009, ¶4). Speaking of “Comrade Castro,” guess who gave ObamaCare high accolades? Why, “Comrade Castro” of course. Mike Brownfield of Heritage Foundation wrote, “According to an Associated Press report, Castro hailed Obamacare as “a miracle” and “an important battle and a success of (Obama’s) government. Castro went on to favorably compare President Obama’s health care plan to the one Cuba enacted a half century ago” (Brownfield, 2010, ¶2-3). The foregoing is just a brief summary of the Marxist ideology that underpins everything Obama does. When he was inaugurated, Obama swore an oath to uphold and defend the Constitution of the United States from all enemies foreign and domestic. But his actions, and prior nefarious associations clearly indicate that his loyalty is not to our country. On Thursday, Obama snubbed Israeli Prime Minister Benjamin Netanyahu at a dinner in the White House. He eschews allies like the United Kingdom, Australia, Japan, Taiwan, and Israel. He prefers the likes of the Castro brothers, Hugo Chavez, and Islamic dictators, many of whom fuse communism with Islam. One bumper sticker turned the name “Obama” into an acronym: “One Big A– Mistake America.” O.B.A.M.A. indeed…. She leads in order to serve, not in order to rule. On the day this photo was taken, she could have been feasting on caviar and drinking Dom Pérignon with the elites in Washington D.C. and primping herself for a presidential run. Gov. Palin in coordination with Samaritan’s Purse led a humanitarian mission to distressed villages in remote areas of Alaska to ensure that families there could survive the severe winter. Kneeling before this child to hold her was arguably Gov. Palin’s finest hour. My president knows how to prioritize. A good Commander cares for her troops and elevates them. My President knows the root cause of 9/11 and will fight to destroy it till the day she draws her final breath. My President reads about American heroes. The book in her hand is: The Book of Mychal: The Surprising Life and Heroic Death of Father Mychal Judge. Between Gov. 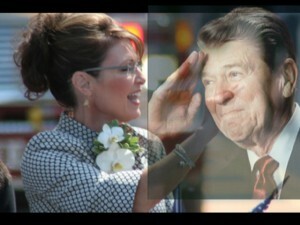 Palin and Obama, there are no pale pastels. The differences are bold and stark. One is a Marxist bent on achieving global equality by diminishing and tearing down the nation he swore to serve. He snubs friends and welcomes enemies. He leads to rule. The other is a Reagan conservative who knows that under the right stewardship our best days are still ahead. She knows that “pretty good” is not good enough, that it is in fact “pretty bad.” She knows we are a beacon of hope and freedom in the world; that we are a force for good. She knows that peace is achieved through strength. So who is fit to serve? Where do their priorities and loyalties lie? “Ambition drives; purpose beckons. Purpose calls.” (Palin, 2009, p. 103). Sarah Palin Reiterates: Never Retreat, Instead RELOAD! Governor Palin spoke before a crowd estimated at over 20,000 yesterday in Searchlight, NV, Senator Harry Reid’s hometown. Her speech drew applause throughout and further energized a crowd that was already fired up. At the start of her speech, she joked about writing on her hand, something she has come to call “the poor man’s version of the teleprompter.” Then she got down to business–God, military, energy, taxes, freedom. And yes, she took on the lamestream media’s ridiculous lie that she and other tea partiers incite violence. Palin said “violence isn’t the answer.” She said “our vote is our arms” and encouraged activists not to be discouraged by the passage of the Democratic healthcare overhaul bill last week, but rather to channel their energies into defeating congressional Democrats who supported the legislation. Contrast that to Harry Reid’s supporters today who allegedly threw eggs at Andrew Breitbart and the Tea Party Express bus. Read about that here and here. I would sit around and wait for the lamestream media and Left-wingers to cry out in outrage against this behavior, but I have things to do and can’t wait that long. In spite of the violent behavior against the tea partiers, nothing dampened the mood. Governor Palin’s speech certainly did not disappoint. The thousands of patriots gathered left more determined than ever to take back the country they so dearly love. Sen. John McCain is facing the hardest election fight of his Senate career as he faces off against J.D. Hayworth, former congressman and conservative talk radio host, who claims McCain is too moderate for Arizona Republicans. Because of the tough fight, Sarah Palin is lending her star power to the man who chose her to be his running mate. Palin appeared with McCain for the first time Friday at a campaign rally since the pair lost the 2008 presidential election. 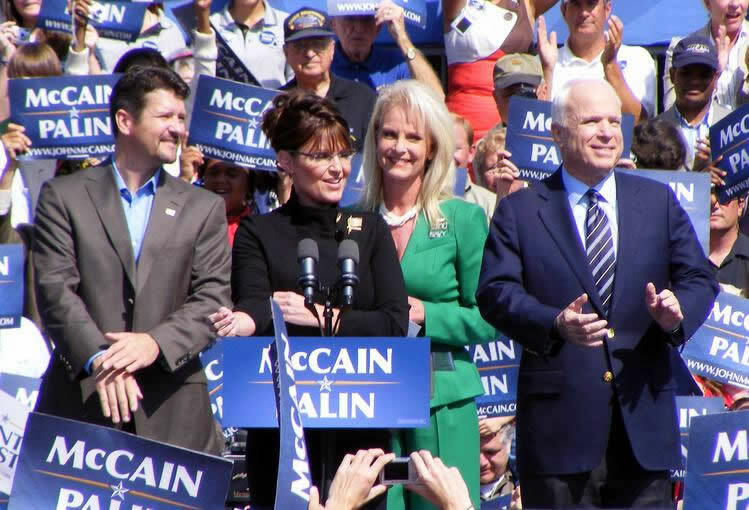 Many were looking forward to the speech Palin gave, but the former governor also wrote an op-ed in Friday’s Arizona Republic, asking supporters to send John McCain back to the United States Senate. 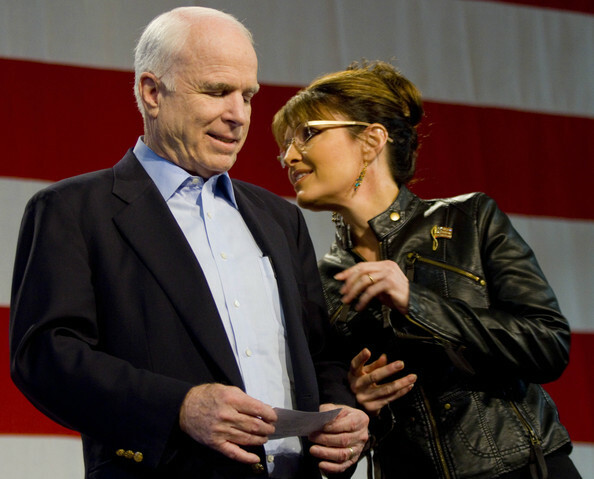 The op-ed titled, “A Desire to Serve Defines McCain,” examines the maverick of the Senate and points out some of the qualities Palin observed as they traveled across the country together. The Tea Party Express stopped in Searchlight, NV in Senate Majority Leader Harry Reid’s back yard (almost literally). Fewer taxes, less government and no "Obamacare." That’s the message thousands of conservative Tea Party activists were hoping to send to Washington as they streamed into Senate Majority Leader Harry Reid’s hometown in Nevada Saturday morning. "Harry Reid is symbolic of the problems in Washington in the sense that he’s been the leader in the Senate of all the things we’ve been against — expanding the government, increasing the deficit, and raising taxes," Sal Russo, chief strategist of the Tea Party Express, told FoxNews.com. "He campaigned as a moderate but has moved so far to the left," Russo said of Reid. "Voters are tolerate of different views, but what they don’t like is when someone campaigns one way and then governs by another." The Tea Party Express, one of the most visible factions of the national Tea Party Movement, officially kicked off its cross-country, 42-city bus tour with Saturday’s rally. Senator Reid is majorly vulnerable as he trails both GOP hopefuls in the latest poll. We know that elections have consequences, as we have well learned from the outcome in 2008. Senate votes have consequences as well. We’re not inciting violence. Don’t get sucked into the lamestream media’s lies about conservative America’s standing up for freedom as inciting violence. Violence isn’t the answer. It’s a bunch of bunk what the media is trying to feed you. Don’t let them divert attention from the debate. Media, you guys ginning up an issue like that making it sound like it is a crowd like this of patriotic Americans who are inciting violence. It’s not true, it’s a bunch of bunk, and we ask for some fair and balanced reporting coming from you please. Apparently though it was Harry Reid’s supporters who were inciting violence. Interesting. I doubt that’ll make it in The New York Times. Politico reported 20,000 in attendance at this event four miles north of this small town in the Nevada desert. Conservatives 4 Palin noted that President Obama drew “hundreds” (or up to 3000) to his kickoff event in liberal Iowa City for his first stop of his temporary victory tour. Who do you think is more energized? Shane Vander Hart is the editor of Caffeinated Thoughts. He loves connecting with fellow Rogues so feel free to follow him on Twitter or friend him on Facebook. This morning Governor Palin dealt handily with a heckler as she was speaking at a McCain Rally in Mesa, AZ. The man had to be removed from the event. This is interesting in light of the fact that dishonest people are accusing Gov. Palin and tea partiers of being boisterous, inappropriate, and violent. The governor told the man to listen and perhaps he’d learn something, but he refused to shut up long enough to learn a thing. She then reminded the crowd that Senator McCain, as a tortured POW, paid the price for that heckler to have the right to protest. Too bad he couldn’t have found a more respectful, constructive way to express whatever disagreement he had. His behavior sort of puts things in perspective, though, doesn’t it? PJTV is covering Gov. Palin’s speech today at the TEA party Express Rally in Searchlight, NV. So far, no embed is available, but live coverage will stream to PJTV’s home page. TEA Party Express is expecting a crowd of over 10,000 and people from all over the country have been streaming in overnight, according to an early morning release. Fox News pre-coverage of the event also reports thousands of people from around the nation descending on the small desert town for what TEA Party Express calls “Showdown at High Noon” (PDT). Friday afternoon, Governor Palin spoke to about 1300 people at the Commemorative Air Force Museum in Midland, Texas. In the evening, she also spoke to an audience of about 400 at a fundraising dinner at the Petroleum Club. Both events were sponsored by the Liberty and Freedom Foundation of New York City. The former vice presidential candidate and governor of Alaska spoke to a crowd of about 1,300 people in folding chairs for the better part of an hour Thursday afternoon at the Commemorative Air Force in an event that was primarily political but between the “Amens” and cowbells from the crowd, often resembled church or a football game. Speaking for the Liberty and Freedom Foundation, Palin said that she felt very welcome in the Permian Basin. “There’s such an appreciation here for your freedom,” Palin said. In addition to energy production, which she called one of her favorite subjects, Palin was focused on getting people out to reverse what she called the leftist direction of the county under President Barack Obama. But she said that media reports mischaracterized the conservative message as inciting violence. “ ‘Take up your arms’ means voting,” Palin said. Although some of the people in the crowd had never heard of the LF Foundation, everyone knew about Sarah Palin and had nice things to say. Rollins even took her daughter Kim Biedeger, 16, out of school to come to the event. “I think with the passing of the health care bill, democracy is on the way out,” Biedeger said. Palin, who said that she was glad to see all of the young kids in the audience, was very critical of the debt she said liberals had created. “That’s selfish and it’s generational theft,” Palin said. Crosby Cobb, a 10-year-old from Greenwood, was also missing school. But for someone who dressed as Sarah Palin for Halloween, this wasn’t a surprise. “She’s just someone who stands up for women’s rights and shows that just because you’re a woman doesn’t mean you can’t do something,” Cobb said. Even though some didn’t support her move to resign as governor, everyone seemed to support her in whatever she did next, whether running for office herself or supporting other candidates. “The opportunity to see someone like this in our area was compelling for my wife and I,” Jerry Berkebile, president of Colt Hill Resources, said. Stephan C. Brown, CAF president, said that it’s exciting any time a celebrity comes to the museum. “We like anybody that can draw a crowd to see what we’re doing,” Brown said. He said, however, that the museum has no political affiliations and the LF Foundation was in charge of the event. The Liberty and Freedom Foundation executive director Victor Cocchia spoke before Sarah Palin and laid out the foundation’s goals to support 10 truly conservative candidates and help elect a majority in Congress in 2010. Palin also spoke at the Petroleum Club from 6:15 p.m. to 8 p.m. Thursday. Tables of eight were $4,000. Tickets for couples were $1,250. The funds raised go to support the Liberty and Freedom Foundation. A photogallery of the event can be found here. Former Vice Presidential candidate and Alaskan Governor Sarah Palin was at the CAF Thursday afternoon. Palin is in town to raise money for the Liberty and Freedom Foundation. This foundation gives money to 10 conservative congressional candidates in hopes they will get elected. If that happens, the GOP will take back some seats in congress and with more than a 1,000 people coming out to hear her speak. The foundation got some West Texas support today. Unfortunately, it was pencil press only, meaning our cameras weren’t allowed in. But, we did manage to take some photographs. When the governor took the stage, a sea of people were on their feet welcoming her. Palin spoke about a variety of different issues going on in our country including healthcare reform, which she called “Obamacare”. Another issue she addressed, which was fitting to West Texas, was of course, energy. After Palin spoke, she then answered questions from elementary students. One student asked, what was her inspiration behind her book Going Rogue? She answered, she wanted to set the record straight and let people know the truth about her family, her administration and her record. 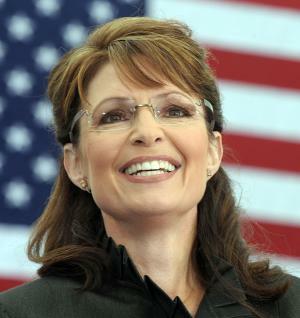 Palin began the day at the CAF Air Hangar, cracking jokes for the audience, and chastising the healthcare reform bill. “We just like to hear from Sarah that she’s going to help get the Republicans back in charge of the house and Senate”, said speech attendee, Dale Wilson. For dinner, Palin chose the Midland Petroleum Club, where she was the keynote speaker for a fundraiser put on by the Liberty and Freedom Foundation of New York City. Mayor, Wes Perry, joined hundreds of others in attendance. “She’s very charismatic. You can understand why she’s the national figure that she is when you hear her speak”, said attendee, Steve Burleson. With video cameras barred from both events, the crowd’s reaction isn’t recorded, but attendees say the crowd loved Palin, who reportedly stressed the importance of domestic energy. “A lot about energy and the economy and the needs of the country to get on the right track”, said spectator, Lonnie Simms, right after the 2nd speech. Of course, it wouldn’t be a visit from, Sarah Palin, without her famous sense of humor. “She said that when she ran for Vice President they finished second out of 2 in the race so everybody thought that was pretty funny”, said Burleson. According the event’s organizers, the proceeds from this evening’s fundraiser go toward grass roots organizing and policy development efforts. Texas has prospered by “sticking to its conservative principles.” That’s the message former Republican vice presidential nominee Sarah Palin preached Thursday during her first of two stops in Midland. Comparing Texas and her home state of Alaska as “big, wide open states with hard working people,” Palin said the conservative governmental philosophy practiced in Texas could be applied nationally to revive the economy. “We need the courage to do what’s morally right and cut taxes so small businesses can hire more people,” Palin told 1,100 applauding, cheering spectators at the George H.W. and Barbara Bush Commemorative Center near the airport. “What makes America exceptional is not her politicians, it’s her people,” the former Alaska governor said. “I see it in our brave men and women in uniform who are willing to sacrifice it all for our country. Palin stringently criticized the health care reform legislation just passed by Congress, saying, “Obamacare is not sustainable. In an apparent reference to reports this week of threats and vandalism aimed at Democratic leaders and their property, Palin said, “We are not inciting violence. Palin’s husband Todd listened in the back of the capacious room, smiling and occasionally talking with a Midland policeman. The spectators were seated by volunteers in pink “Palin T-shirts,” and there was a question-and-answer session after Palin’s 22-minute speech with five schoolchildren asking questions. She said she would discuss energy production later at the Petroleum Club, where some 400 people had paid $1,250 per ticket and up. Both events were fundraisers for the Liberty & Freedom Foundation, a conservative group based out of New York City. “God created these rich resources in Texas,” Palin said, adding that the U.S. is asking foreign countries to sell it more oil because it has neglected its domestic production.